a plasterer (q.v.) who specialises in making by hand, with wooden tools known as scapels, models to scale in plaster of Paris, clay or gelatine, from architect's design; makes the moulds from such models by pouring liquid plaster thereon. measures required quantities of ingredients, usually resin, whiting, glue and oil, to make "compo," or composition for relief decorative work; ingredients vary, according to different qualities of compo required, known as "composition," "carton pierre," and "papier mache"; heats each ingredient in a separate copper or jacketted boiler, which is heated by steam generated by gas; regulates heat of copper; mixes contents of each copper by stirring it.by hand; pours contents of all four coppers into a tub or other receptacle, and mixes them together, with a long piece of wood, to consistency of putty; cuts compo when mixed, into suitable sizes by hand with a knife, and places these pieces on floor of workshop to cool; when required for mounting on wall or cornice, re-heats compo in steam-heated boiler to consistency of putty, and presses it into specially prepared wooden moulds by hand; then puts moulds into band press and presses compo and moulds with hand levers; removes moulded compo from press and trims it, by hand, ready for mounting. nails or screws fibrous plaster on walls or ceilings; fills-in joints and sometimes finishes corners or mitres, with specially prepared plaster, using trowels and other hand tools; sometimes done by a plasterer (q.v.) specialising in such work. a plasterer (q.v.) 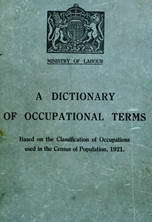 who applies plaster with a trowel to a cotton sheet held in a rough framework of laths, "stick and rag work"; builds up plaster ornaments, e.g., ceiling cornices, "roses" for ceiling centres, in plastic state, and applies wooden moulds thereto to give shape of article required; finishes-off plaster ornaments with trowels and other hand tools. nails laths in position ready for plasterer; in many parts of country done by plasterer (q.v.). applies plaster with plasterer's trowel and float to walls, ceilings, partitions, etc., to render a smooth hard surface; sometimes previously affixes laths over which plaster is spread. (iii) directs mechanically-pumped streams of mortar, and afterwards shingle, on to exterior surface of walls. carves designs on cement work or stucco, on exterior of a building, when it is partly set, or draws lines on otherwise plain work representing blocks of stone, using small pointing trowels or other tools.